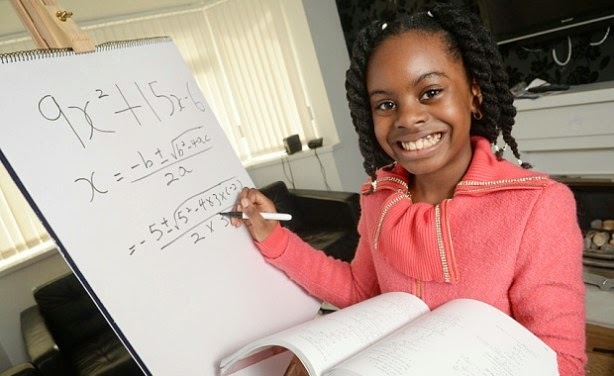 Ten year old Esther Okade, one of UK's youngest students from Nigeria, she has just been accepted to start her maths degree at the Open University. Esther, who was accepted three weeks ago, is already at the top of her class, scoring 100 per cent in a recent test. Esther's mother, Efe, said the process of getting her to the university was a different one because of her age. she said "We even had to talk to the VC and after they interviewed her, they realised that this has always been her idea from the beginning. From the age of seven Esther has wanted to go to university. "But I was afraid it was too soon. She would say, 'mum, when am I starting? ', and go on and on and on. Finally, after three years, she told me, 'mum I think it is about time I started university now." Though she watches cartoons and plays with barbie dolls, Esther's aim is to get First Class honours degree in two years and start a PhD programme then. She also intends to run her own bank.